Giving a customer efficient and flexible access to large amounts of data is a complex challenge. Our collective expertise in database design, optimization and administration has helped numerous clients in product selection, transitioning data and developing sensible user interfaces to best suit their data processing needs. 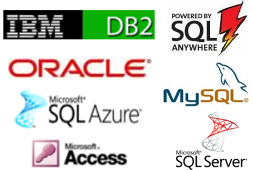 Our family of highly skilled database administrators and database developers know how to maximize system performance, and understand the critical issues of database maintainability and internal consistency. We consider it a priority to ensure that our database solutions can expand and evolve as client’s data storage and retrieval requirements grow.